Isolated and full of mystery, Easter Island is one of the most fascinating places on Earth. The remote Pacific Ocean island – Isla de Pascua in Spanish but called Rapa Nui by locals – is dotted with volcanoes and is strewn with Moai, the island’s iconic ancient stone statues. One of the top things to do in Easter Island is to visit the Moai sights and learn about the history of the Rapa Nui people. 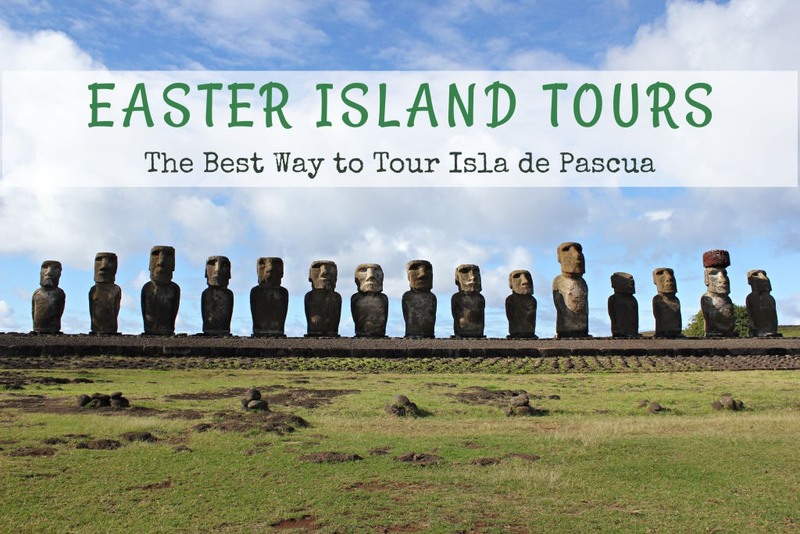 Visitors can explore the island on their own or join one of the top-rated Easter Island tours. During our Easter Island visit, we explored some of the island on our own – but also joined a guided tour for a full-day adventure. In general, we are very independent travelers and like to discover places at our own pace. However, the tours on Easter Island that are led by local guides provide incredible insight into the place and people; the guided tour exponentially enhanced our visit to Easter Island. Before booking an excursion with one of the Easter Island tour companies, you need to decide which Moai archaeological sites you want to see. The Moai platforms are scattered across the island – and it’s nearly impossible to see all of the Easter Island tourist attractions in one day. 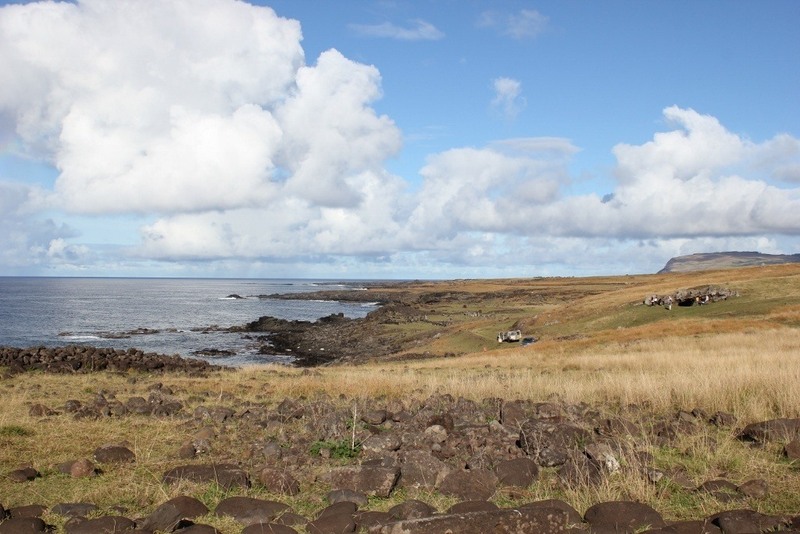 Top Rapa Nui sights include Ahu Tongariki, Anakena, Rano Raraku, Orongo, Rano Kau, Ahu Akivi and Ahu Tahai. Most Easter Island tours include 4-6 top sights that are located in close proximity to each other. While there are numerous options when it comes to tour route combinations, we think there are 3 Easter Island tour routes that offer optimal sightseeing. 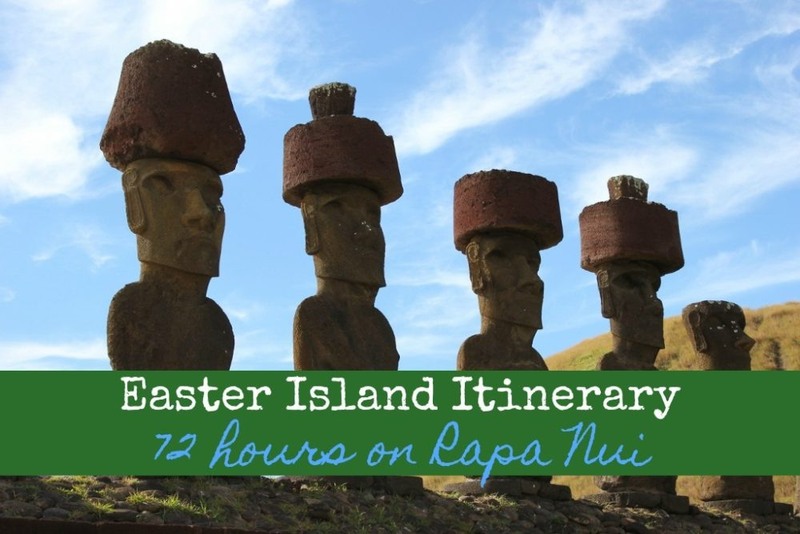 The full-day Easter Island Tour explores the east side of the island – and the most popular Moai sights – beginning in the south and ending in the north. The tour visits 5 must-see Easter Island sights, including Ahu Akahanga, Ahu Tongariki, Rao Raraku, Ahu Te Pito Kura and Anakena. We joined the Easter Island Full-Day Tour because we could not have imagined visiting Rapa Nui without seeing the most iconic Moai sights. We share the complete details of this tour in a minute! The Half-Day Southwestern route features Moai platforms, manmade dwellings and natural landscapes. The 4 stops on the tour are: Ahu Tahai, Ana Kai Tangata Cave, Rano Kau volcano and Orongo village. Rather than joining a tour, we completed this expedition without a guide. 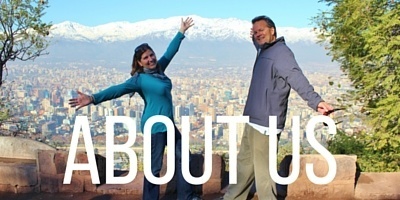 We didn’t use a car either – we hiked it! 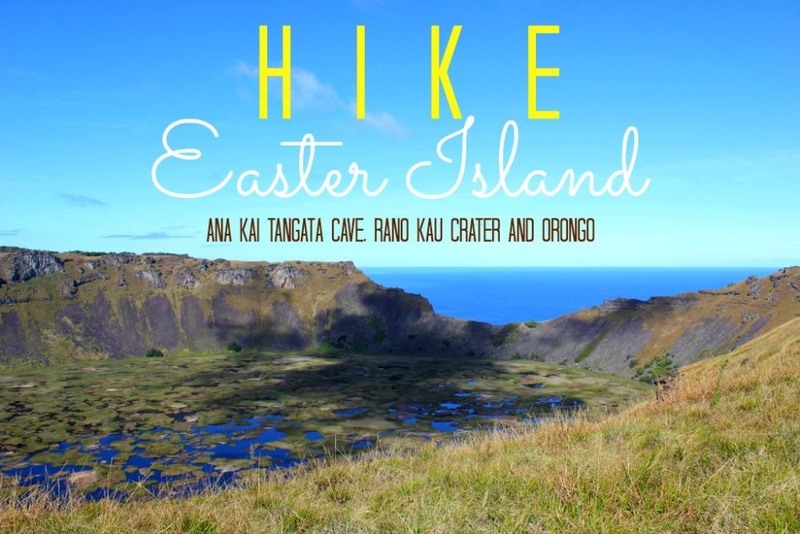 Get the details of our Easter Island Hike! The half-day Moai Tour introduces visitors to lesser-visited Moai sights. The sights visited are: Ahu Akivi, Ahu Vinapu, Puna Pau and Hanga Piko. Although we were eager to see the seven famous Moai at Ahu Akivi, we did not join this tour. We endured foul weather on the day we wanted to partake in this trip and decided against it. While day trip experiences can differ by companies and guides, the following outline is the most popular route of all Easter Island tours. Duration: 8 hours; Pick up around 9:00am and drop-off before 5:00pm. Book The Full-Day Excursion Online! On the morning of our Easter Island bus tour, we were picked up from our lodging at around 9:15am. We were the only English-speaking participants, but our Rapa Nui tour guide was fluent in English and able to translate his passion about his people, land and history. One of the best reasons to join one of the tours on Easter Island is the information that is shared throughout the tour. Our guide proved to be an incredible wealth of knowledge, providing historic facts and dispelling myths about the Moai. Our native Easter Island guide helped us to better understand the history of the Moai and Rapa Nui. The Moai were constructed from 1250 AD to 1500 AD. Moai are not gods. Each statue represents and honors a great tribe leader after their death. The Moai were positioned to face inland – not toward the ocean – as a means of watching over the community and people in their tribe. 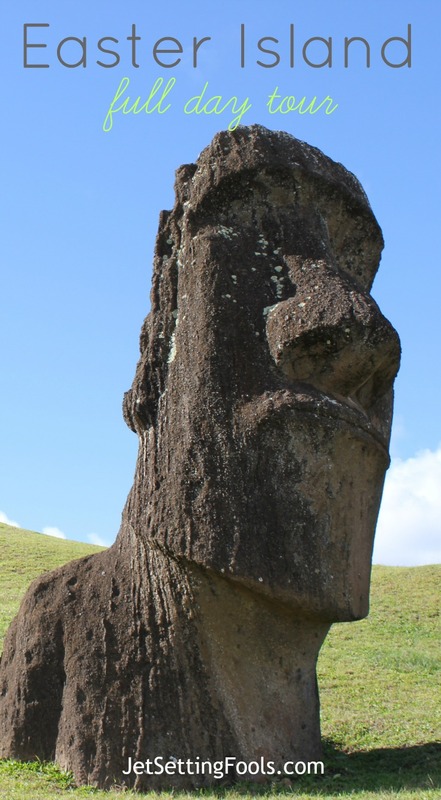 All Maoi were carved from the same quarry, Rano Raraku, and then transported and erected on the platform (called an ahu). It was only after they were standing that they were given eyes; it was a symbolic opening or waking the spirit. The topknot, which wasn’t originally used, is meant to represent the hair, not a hat. The stone used for the topknot came from volcanic rock of a different quarry than the one used for the bodies. Over time, the tribes began carving larger statues. The oldest statues are fairly small but increased in height and detail over the years. Over a thousand Moai statues were carved over a period of about 500 years, but not all of them were erected. At one point during the Moai era, all the statues that were standing were pushed to the ground by human hands (not by natural forces). When they were pushed over, they often broke at the neck (the weakest point). In the tumble, they also lost the coral eyes (only one original eye remains and is on display at the local museum) and the topknot, which due to its shape, would often roll far away. The exact reason for the creation – and eventual destruction – of the Moai is unknown. There are no written documents and the entire civilization was decimated, leaving no one to tell the story. A popular theory is that as resources became scarce, the tribes went to war in an effort to secure necessities to survive. After one tribe conquered a rival, they would push the defeated tribe’s Moai face-forward to the ground to symbolize that they no longer had a protector. 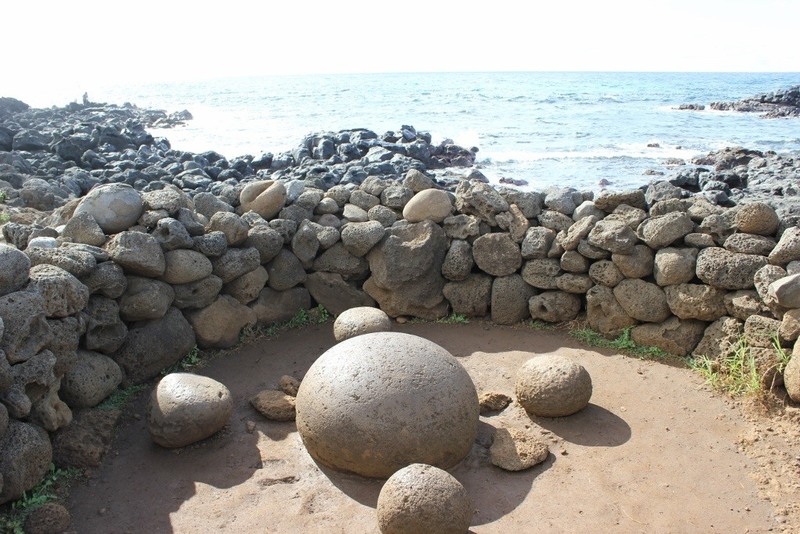 Much restoration took place on the island from the 1950s to 1990s, but not all Moai have been restored in order to preserve details for future archaeologists. Routes will vary by tour and may not make stops at the exact same platforms. However, the most popular tours include stops 2 through 6, as outlined below. Route Map. The first stop on our All-Day Rapa Nui Tour was Vaihu. The Vaihu platform has been left unrestored – so what we saw were 8 Moai lying face down. The Moai have been left untouched since they were toppled over nearly 300 years ago. 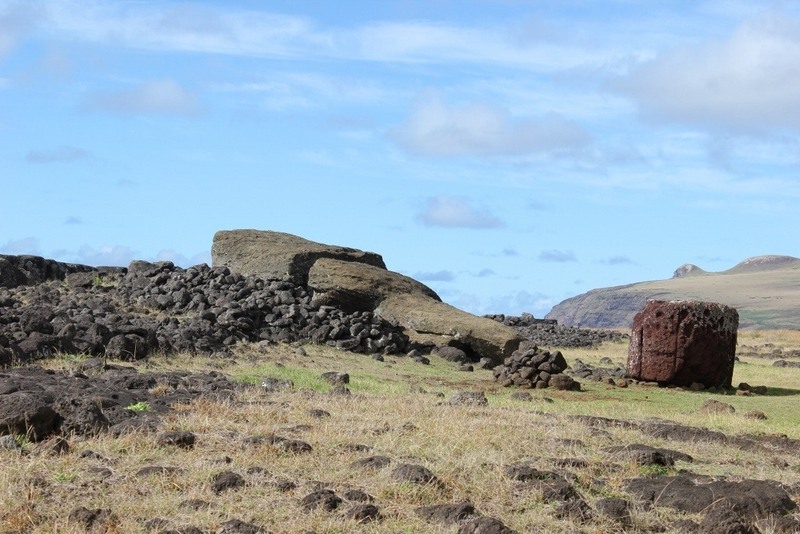 Seeing the Moai in a destructed state provided insight into the ancient Rapa Nui culture. At Akahanga, we learned about how the tribes may have lived on the land. During the stop, we saw the remains of an unrestored platform with 12 scattered Moai and evidence of shelters and kitchens. The settlement was established near a cave. The cave was likely used as protection – from the elements as well as enemy tribes and foreign explorers. Our guide showed us the 13 outlines of traditional ‘Boat Houses.’ The homes – actually built on land and only called Boat Houses because their long, skinny shape resembles a canoe – were where the people slept. The proof of kitchens is evidenced by 3-foot-by-3-foot holes in the ground, lined with volcanic rocks. It was explained that food was cooked in these underground, natural ovens (similar to the curanto). Tongariki is the most famous of all Easter Island Moai platforms. It’s the largest ceremonial platform on the island – and in Polynesia – measuring 220 meters (721 feet). 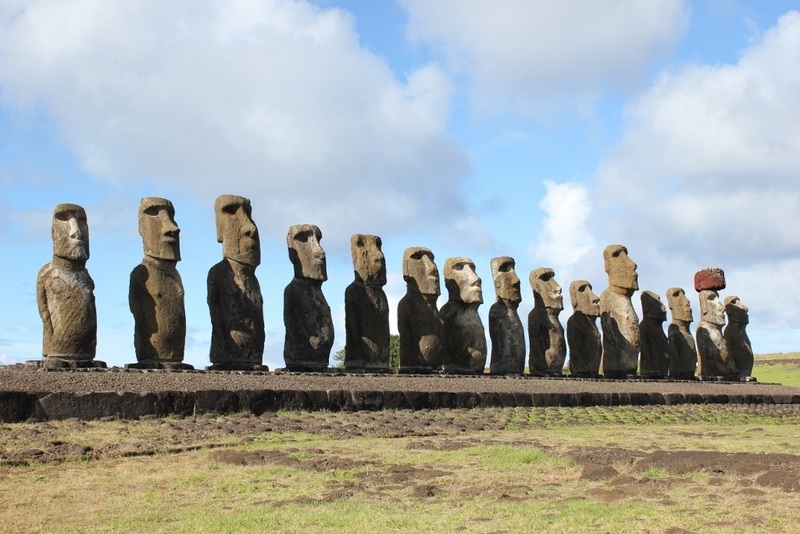 The platform grandly features 15 standing moai…plus one more lying broken in the pasture. (It is believed that the broken Moai was never stood upright, so it was left in the field when the platform was reconstructed). Tongariki is an incredible, awe-inspiring sight. The unfathomable work required to carve – and then move! – these colossal tributes is a testament to the dedication and beliefs of the tribes of the Moai period. It truly boggles the mind that a primitive, isolated society had the capacity to create such grandness, but the evidence is standing there…all 15 of them. 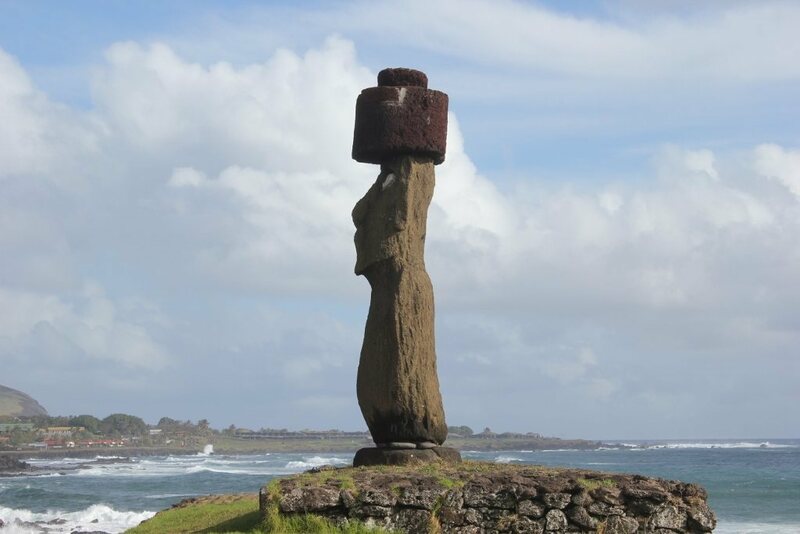 It was from one quarry, Rano Raraku, that all Moai on the island were carved. And visiting the quarry is a surreal experience. Nearly 400 yet-to-be-completed Moai litter the Rano Raraku grounds, looking like over-sized chess pieces scattered on the lawn. There has not been any restoration in the quarry; everything is exactly as the tribes left it. The scene appears as if one day the workers just dropped their tools and walked off the job. And it’s fascinating. The Moai at Rano Raraku – which seem to be frozen in time – are in various stages of creation. Some were obtaining final, intricate details, while work on one new Moai was just beginning. The partially-carved Moai has yet to be detached from the quarry walls. Among the various stages of Moai completion, we also witnessed numerous Moai that lay broken at the bottom of the hill. The theory is that the brand-new Moai were dropped or otherwise cracked during transport from the quarry. It is believed that these Moai were left abandoned, as the spirit would have escaped at the breakage and, therefore, a new Moai would need to be carved. While no one is certain how long it took to create a single Moai, it is estimated that the work took 1-2 years in the quarry. The transportation of the giant statues – some weighing up to 70 tons – remains a mystery. There are numerous theories regarding how the Moai were moved, but one thing is certain: it wasn’t an easy process. Additionally, Paro is one of the last Moai known to be standing, as reported by a French explorer in 1838. However, it was soon after that Paro was thrown face first into the dirt, where it remains today. The topknot – also huge (it is measured at 2 meters in height and weighs 10 tons) – lays nearby. A secondary sight at Te Pito Kura is The Naval of the World. Although some (including our tour guide) consider the supernatural sight to be a gimmick, but it is still included on most Easter Island day trips. The five large, smooth and rounded rocks – one in the center and four surrounding it serving as ‘chairs’ – have magnetic qualities. The stones heat up in a hurry under the hot tropical sun and plays havoc on compasses. There are many mystical theories about the positioning of these rocks next to the platform, but most locals don’t believe the hype. How and why they are there remains a mystery, but not likely a magical one. It’s easy to understand why the powdery sand beach and clear turquoise water at Anakena was a ceremonial sight for the ancient tribes. The sight, which was the last stop on our Easter Island discovery tour, is simply breathtaking. The Moai on the restored platform at Anakena are some of the best-preserved on the entire island. When they came crashing down, they landed on the soft sand and were subsequently covered by said sand, which protected them from the natural, harsh elements on the island. The detailed etching of ears, nose, fingers and even an apparent belly button are amazingly preserved. Spending time at the beach or swimming was part of our tour of Easter Island. Even though a bit on the chilly side, we couldn’t resist jumping in (or, in Kris’s case, diving in) and taking a swim in the tropical paradise. When booking your Easter Island tour, make sure to find out if swimming is on the agenda…and be sure to bring swimming attire if it is! 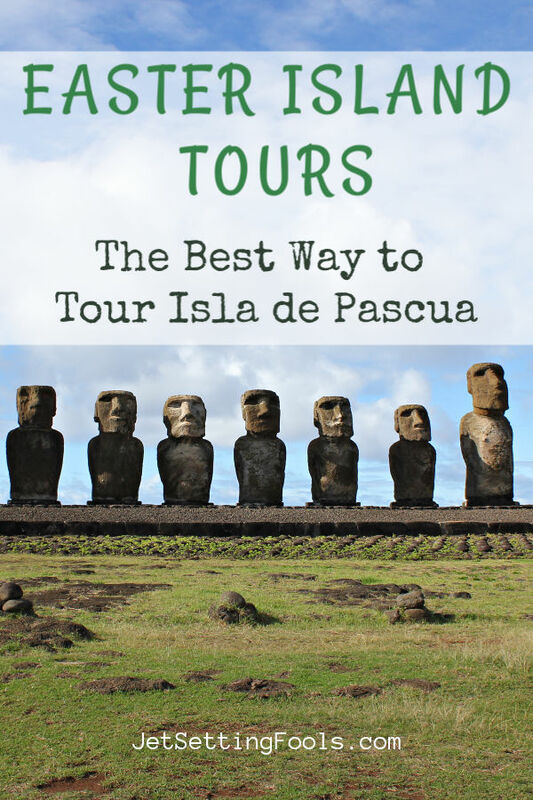 What Is The Best Way To Tour Isla de Pascua? Before our Rapa Nui trip, we debated about how to tour Easter Island. Hike or bike? Rented car or guided tour? On our trip, we experienced two ways to tour Isla de Pascua: hiking on our own and letting a local guide lead the way. Each had pros and cons. We absolutely loved our hike from Hanga Roa to Rano Kau volcano and Orongo village. The scenery was spectacular and we could linger over the views as long as we liked. Stretching our legs after a long day of travel also suited us, but visitors can also rent a car or motorcycle and visit the same Easter Island attractions. The one draw back to setting off on our own was that we didn’t get the whole story. We used a guidebook to read about the events that took place at Orongo, but feel we would have benefited from having a local guide explain the important details of the historic place. The tour we took was superb! Our guide was phenomenal and the day was well-organized. We had plenty of free time to roam (and swim!) on our own, but the guide was always nearby if we wanted to ask questions. We love when tours meet (or beat!) our expectations – and they certainly did in this case. At the end of the day, we had a deeper understanding of Rapa Nui…and saw the island’s most incredible sights along the way. One hesitation for booking guided tours is that they come at a cost – as in, they are not free. Travelers on a budget may veer toward seeing the island on their own. Although we are budget-conscious travelers, we thought the Easter Island tour was well-worth the cost. We think the best way to experience Easter Island by joining the full-day guided tour for the main sights – and then taking some time to discover part of the island on your own! 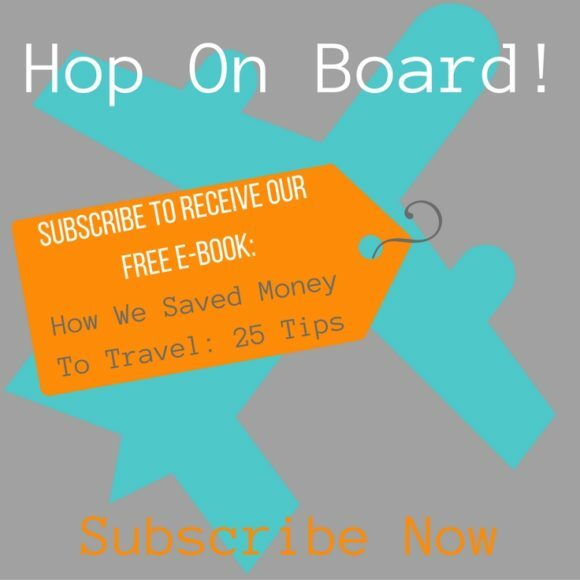 Just a few more tips for your trip! Not all online tours will pick up guests at the boat terminal. Guests arriving on an Easter Island cruise need to make sure they book a shore excursion with a company that will pick up from the dock. Visitors can book Easter Island excursions with a private guide. Easter Island tour guides can be booked online in advance with Viator. 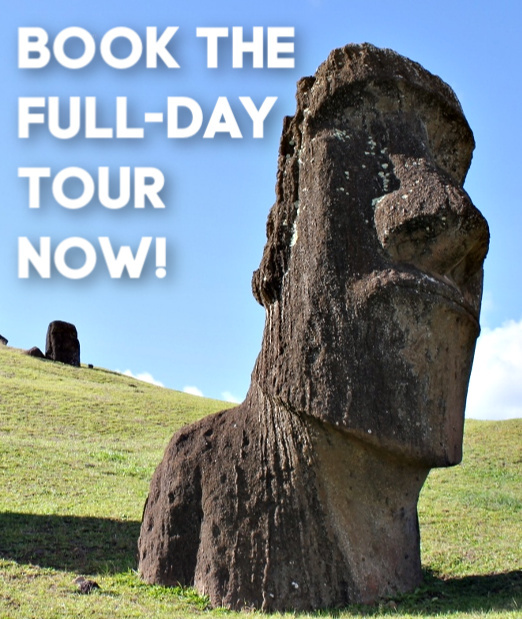 Prices vary by Easter Island tour operators and included offerings. 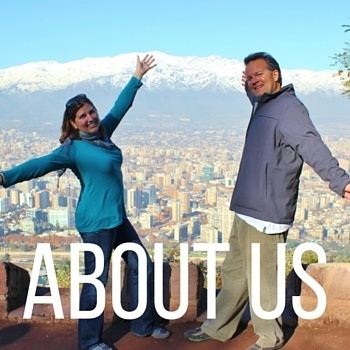 Before booking a tour online, be sure to read all the details of the tour, as well as fellow traveler reviews! Find traveler-rated tours on Viator. 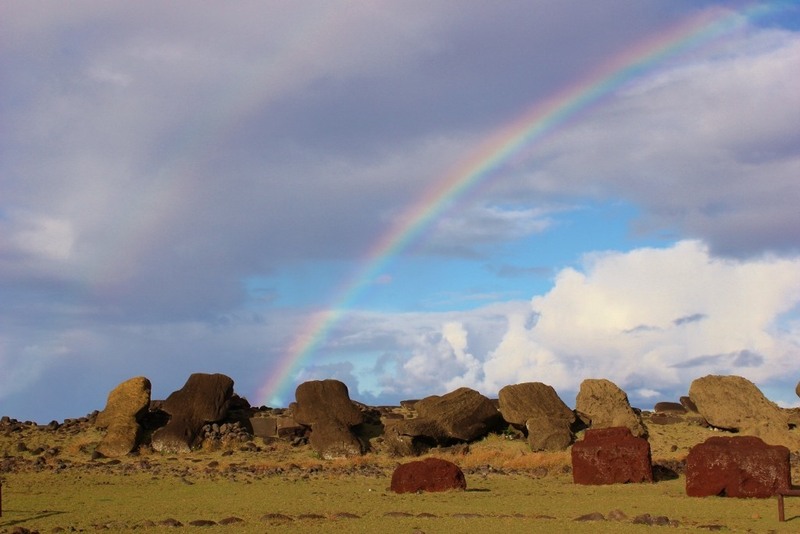 All sights require – but rarely include – the National Rapa Nui Park Pass. Visitors can purchase the pass ($60 USD currently, but could be increasing to $80 soon) on arrival at the airport. 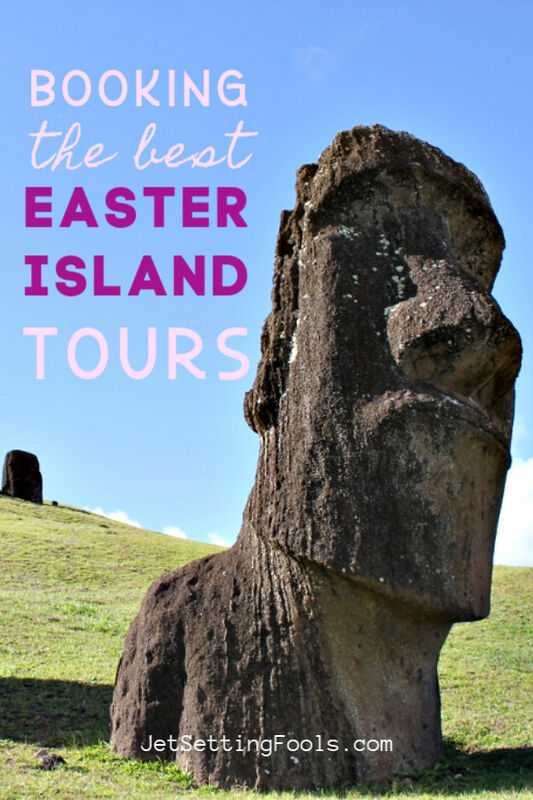 Find more information about visiting Easter Island – such as How To Get There, Where To Stay and How to Plan an Easter Island Trip – should take a look at our Easter Island Itinerary. Don’t forget to pack a pair of lightweight and comfortable walking shoes. I (Sarah) have traveled with these shoes by Columbia and Reef. Kris prefers wearing these shoes by Merrell and Sanuk. We want to know: Have you taken any Easter Island tours? Which was your favorite? What were the highlights? Give us your best tips and recommendations in the comments below!